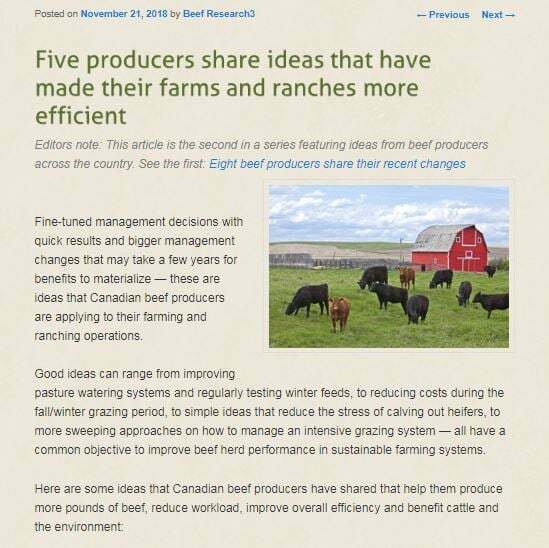 Fine-tuned management decisions with quick results and bigger management changes that may take a few years for benefits to materialize — these are ideas that Canadian beef producers are applying to their farming and ranching operations. Good ideas can range from improving pasture watering systems and regularly testing winter feeds, to reducing costs during the fall/winter grazing period, to simple ideas that reduce the stress of calving out heifers, to more sweeping approaches on how to manage an intensive grazing system — all have a common objective to improve beef herd performance in sustainable farming systems. Research and resources to assist producers in making small, incremental changes to their operations are available on the Beef Cattle Research Council (BCRC) website. The BCRC is supported by producer check-off dollars, and producers are encouraged to utilize the resources like production calculators and decision making tools, free webinars and more.